AEGEE-Leiden: one of the oldest locals of AEGEE-Europe, still alive and kicking! The AEGEEan interviewed E.G. & Margo van Berkum at the Agora Budapest about their local, the Show Your Colour (SYC) concept and future plans for this antenna. Eline is a former board member and now Speaker of the Advisory Board of AEGEE-Leiden, here at the Agora Budapest she is a delegate. On European level she is the Policy Officer for Social Inclusion with a focus on LGBT (lesbian, gay, bisexual and transgender) policy. 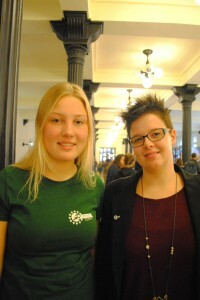 Margo van Berkum is a second year member of AEGEE-Leiden, here in Budapest as a visitor at the Agora. It is her first Agora and she is enjoying it to the maximum. She is currently not in a commission on local level because she is very active in the study association of her university. Your antenna is nominated because it is a very successful antenna, also because you have been organising the popular Show Your Colour concept for seven years now. What do you like most about this event? Margo (M): Perhaps it is the fact that all Dutch locals come together here, and Belgian locals and often even representatives from the Comité Directeur (CD). Three years ago we also had visitors from AEGEE-Mannheim. So the best part about it, in my opinion, is that it brings so many people together. Eline (E): Plus it is a party for new members. Not specifically, but a lot of locals see this party as the closure of their introduction period. 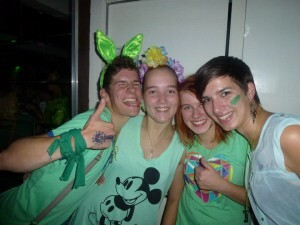 For many newbies it is the first big AEGEE party. But of course old members also keep coming back because it is such a big and successful event. Why was this event created? Why is this event called Show Your Colour? E: There is not a fixed concept but every local gets a particular colour. So for example if Leiden gets the colour red, you dress in red and make it as crazy as you want! Every year they get a different colour. It is an easy way of a thematic party and you can recognise who is from where. M: So ‘’show your colour” actually means show from which local you are! Plus it enhances a feeling of inclusion for new members within their antenna; all together in the same colour! What else do you do during this night? E: We have a nice speech around midnight where we express what the event means to us. This year we used that moment to honor Annelies Koop; the initiator of this event. She has just been made honorary member of AEGEE-Leiden. M: And of course there is some traditional flag stealing! How do you feel the event contributes to AEGEE? M: It brings so many locals together so it creates a bond. It increases the bond within your local, so internally – because each local has one color – and on the other hand because everyone is from AEGEE so you have the common spirit as well. E: The Dutch locals are closely connected in more ways than one, we have a great cooperation, and this party enhances that. M: It is a positive start of the new year, all together. We start off the year together before we all have the Network Meetings, Agora, Regional training courses and so on. What is special about AEGEE Leiden? E: We are one of the founding locals of AEGEE-Europe. So we where there from the very beginning and still alive and kicking! How did you feel about the nomination? Alicia: We felt really honored when we found out that out of over 200 locals in the whole network we were selected as local of the month! What other things are you doing now in AEGEE-Leiden? A: In AEGEE-Leiden we are busy setting up a workshop evening, so that our members get to know more about the European Network. There will be speakers from the Environmental Working Group, Human Rights Working Group and the project Health4Youth. Next weekend we will have a hitchhiking competition to Brussels, were we will be visiting the CD House. Also we are organising a fantastic New Year Event and a lot of local activities, like social drinks, dinners and parties. A: We hope to organise a Network Meeting in spring and we hope that a lot of our new members will become active on European level!